Today's paper features a story about the University of Minnesota suing a website operator who posted a cheat sheet for a renowned psychological test developed at the university. I've posted the lawsuit below. But I also wanted to share to share a fascinating story on the history of the MMPI, by Maura Lerner. 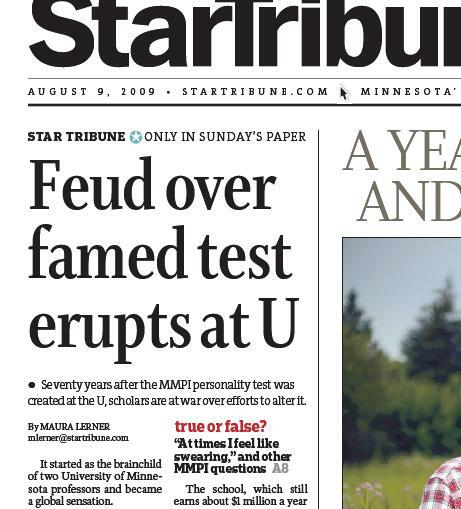 Her 2009 article, "Feud over famed test erupts at the U," gives a behind-the-scenes look at the academic controversy surrounding the new version of the psychological assessment. It started as the brainchild of two University of Minnesota professors and became a global sensation. It remains the most widely used personality test in the world, assessing the emotional stability of millions of people. But now the legendary MMPI -- the Minnesota Multiphasic Personality Inventory -- is stirring up some emotional turmoil of its own. The 70-year-old test has undergone a dramatic makeover recently, sparking a bitter feud among its leading scholars. The debate, which started in professional journals, has boiled over into courtrooms and triggered at least two internal investigations at the university. The school, which still earns about $1 million a year in MMPI royalties, says it merely put a 21st-century spin on a test created during the Great Depression. Today, the MMPI is routinely used to screen candidates for highly sensitive jobs -- pilots, police, nuclear power plant operators -- and in charged legal situations, such as child custody cases. But critics say the changes, such as a new scoring system and a form that eliminated 40 percent of the questions, damaged the test's credibility and backfired on some patients. Read the rest of the tale here.